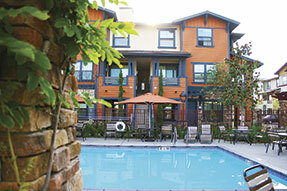 Seven, newly constructed apartment structures, all three-story walkups; 92 units total including a manager’s apartment. Five buildings are devoted exclusively to apartments; another includes a community room and a laundry facility; and the seventh contains a preschool, a second laundry room and swimming pool equipment. Hot water for (1) a bathroom sink and shower, and a kitchen sink in each apartment; (2) student restrooms for the preschool; and (3) the two laundry rooms. 98 Noritz tankless water heaters, including one for each of the 92 apartment units, plus two for each of the laundry rooms and one apiece for the community room and the preschool. Units are concealed in different locations, depending on the floor plan. Plan C — in a hallway closet. 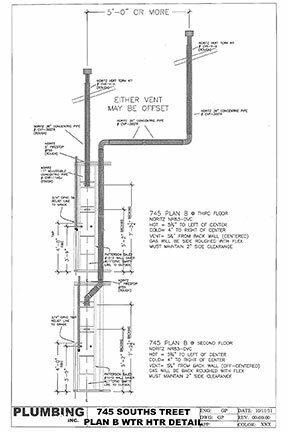 Venting was done through the roof with stainless steel in all instances except the laundry rooms, where condensing water heaters permitted the use of PVC venting. NR66-SV, NR83-DVC and NRC98-DV, all manufactured by Noritz. Visit the Noritz website for more information about products mentioned in this case study. 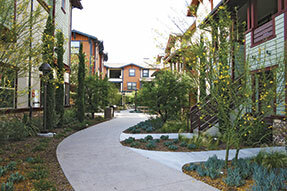 New Southern California affordable apartment community provides residents the latest in water heating technology that promises to save both energy and space. 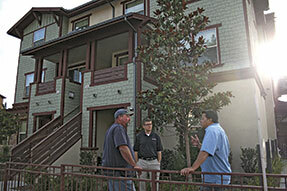 ANAHEIM, CA (July 2012) — Hundreds of details must come together to build any type of residential structure. For a new apartment community, increase the hundreds of details found with a single-family home by a factor of 10—maybe more. Some of those details are non-negotiable: code requirements, local zoning rules and energy-efficiency mandates, to name just a few. 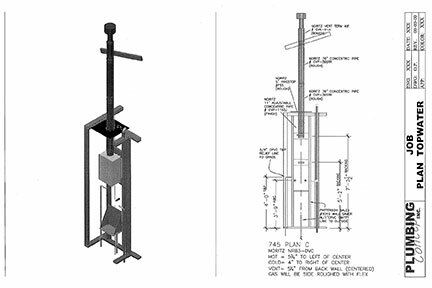 Others fall into what can be called the optional category: aesthetic considerations, plan modifications, product specifications or construction schedules. In an ideal world, the nonnegotiable and the optional do not conflict. But anyone ever involved in a building project knows the “ideal” rarely—all right, never—makes even a cameo appearance. Every detail, negotiable or not, impacts the schedule and the bottom line for builder and subcontractor alike. 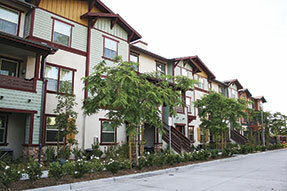 The construction team at Vintage Crossings, a 92-unit affordable apartment community in Anaheim, Calif., puzzled together countless details to plumb each living unit with an individually metered, gas-fired tankless water heater, for a total water heater count of 98. 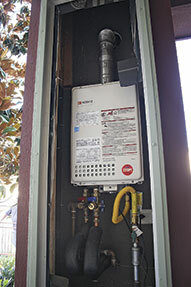 Three different Noritz models, the NR66-SV, the NR83-DVC, and the NRC98-DV, ultimately replaced the tankless water heaters included in the original specification. The team of trade professionals behind the spec changes includes project superintendent Bob Pitsenberger of Portrait Homes; estimator Jay Hoke and engineer Greg Paulino of Plumbing Concepts; and builder sales manager Craig Burns of Noritz. This quartet worked together to select models that better met tough, mandatory energy-efficiency goals, while also solving numerous aesthetic considerations that mattered to the owners of Vintage Crossings and their future residents. 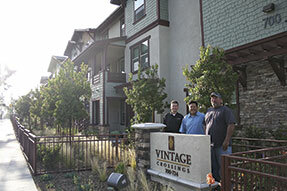 Problem-solvers: At the forefront of innovative solutions at Vintage Crossings was Plumbing Concepts’ new-construction services team, a group that blends decades of hands-on plumbing experience with a commitment to provide the highest-quality, residential plumbing systems. Building 7: a single-story preschool, a second laundry facility and a room that houses the equipment for the community pool. From the outset, the publicly funded Vintage Crossings had to exceed most energy-efficiency standards. In addition, the owners told the construction team that they intended to apply for LEED Silver Certification from the U.S. Green Building Council. The final specifications combined tankless water heaters with R-19 insulation and many other energy-saving factors to meet both goals. 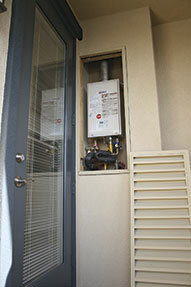 The two Noritz models installed in the apartments—the NR66-SV (single vent) and the NR83-DVC (direct concentric vent)—more than met the mandated efficiency standards. But the construction team also had to grapple with certain aesthetic issues. Buildings 1 through 5 contain similarly sized apartment units, but they are pieced together differently. 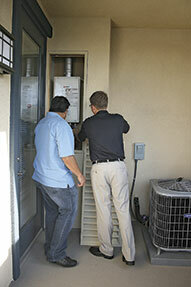 As a result, Floor Plans A, B and C each locate the water heater in a different place. 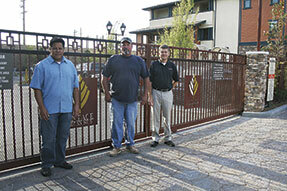 The mix of apartments with functional spaces in Building 6 required a separately engineered installation solution. The preschool in Building 7 had decidedly different water heating needs, especially with regard to venting, than its residential counterparts. Assembling the pieces: Plan A presented the greatest installation challenge. Located above every Plan A unit, which is always situated on the ground floor, are two Plan C units on the second and third levels. 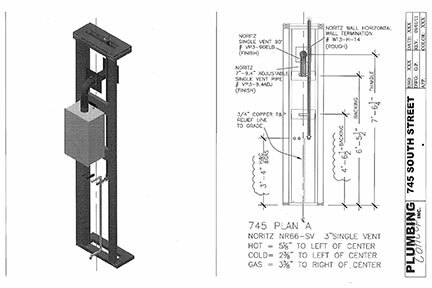 As a result, it was impossible to vent the water heaters inside the Plan A units vertically from the ground floor through the roof — and through the two Plan C apartments in between — and still achieve the required clearances. 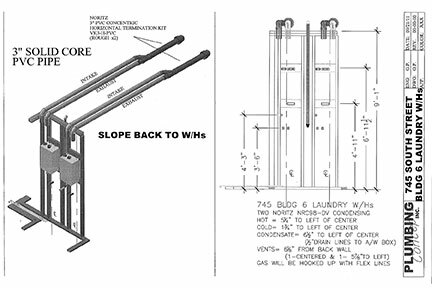 “Clearance” here refers to the minimum spacing stipulated by the National Gas Code between the tankless unit, its venting and nearby windows, doors and walkways. The years of experience Paulino and Pitsenberger brought to the project, combined with Burns’ product knowledge, resulted in a highly original installation solution. 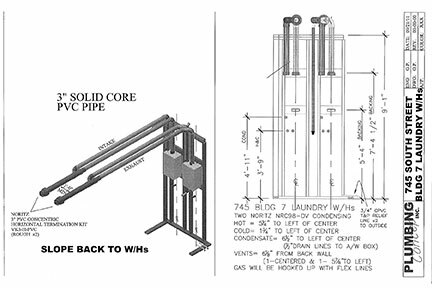 Outside each Plan A apartment is a 2-foot by 2-foot column that inspired Paulino to “get creative” by housing a tankless heater inside the column in a specially built cabinet with a louvered door (to provide adequate air flow for combustion). Venting terminates to the side of the column, which also supports the deck of the Plan C apartment above. “That column was the only place I could actually install and vent the Plan A water heaters, given the clearance requirements,” says Paulino. The engineering for Plan B required nearly as much creativity as Plan A. Plan B is a single-level unit that occurs on both the second- and third-story of each building. Each Plan B apartment has a covered balcony where a specially built closet with a louvered door houses its water heater, which vents vertically through the roof. Whenever there is a Plan B on the second floor, there’s another B unit directly above on the third floor. Consequently, the second-floor water heater must vent through an identical third-floor closet on its way to a rooftop termination point. Using concentric venting, Paulino split the two vents from one another in the attic to maintain the required clearance between terminations. Plan C is a two-story unit, spanning both the second and third floors. The water heater solution here was relatively straightforward: Each C unit has an NR83-DVC heater housed inside a hallway closet on the upper level and vents vertically through the roof. Condensing alternative: While the community room in Building 6 and the preschool in Building 7 also are equipped with NR83-DVC tankless units, the laundry room in each building required a third solution: a condensing-type water heater. Each laundry facility draws hot water on demand from a pair of tankless units, but because of space limitations, a through-the-roof vertical vent run was not possible. Instead, Paulino had to design a horizontal run of approximately 15 feet in each space. Fifteen feet of five-inch/three-inch, concentric Category III Stainless Steel carries a fairly hefty price tag, both in materials and labor. Noritz’s Burns recommended that Paulino switch to a higher-efficiency condensing model that would permit venting with less-expensive, installer-friendly PVC piping. Condensing tankless water heaters use a secondary heat exchanger to boost efficiency by capturing heat from combustion gases before they escape up the flue. This heat-absorption process, in turn, cools these gases enough to allow venting with plastic instead of metal. For Pitsenberger and Portrait Homes, all the upfront work and plumbing engineering gymnastics eventually led to the primary, desired outcomes: a contented owner and a great-looking project that also finished on time and on budget. NORITZ AMERICA CORPORATION, a subsidiary of Noritz Japan, has corporate offices in Fountain Valley, Calif., and Atlanta, offering a full line of tankless water heaters to meet the hot water demands of residential and commercial applications. Noritz supports its products with a national network of skilled representatives and employees who are committed to providing the finest products and services to our communities by helping consumers live in a more comfortable, efficient and healthy lifestyle. For more information on Noritz America and the entire line of Noritz’s ENERGY STAR® tankless water heaters, please call (877) 986-6748 or visit our website at www.noritz.com. The zip archive expands into a .tif file; 6" x 4" (1800 x 1200 pixels) x 300ppi, whether horizontal or vertical; CMYK; unless otherwise specified. Larger sizes may be available, upon special request. 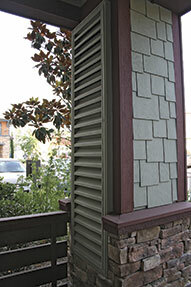 Outside Plan A, a two-foot x two-foot column houses the tankless heater in a specially built cabinet with a louvered door (to provide adequate air). 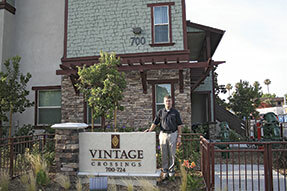 Portrait Homes project superintendent Bob Pitsenberger worked with Plumbing Concepts to balance energy efficiency goals and esthetic considerations at Vintage Crossings. Plumbing Concepts Engineering Department Manager Greg Paulino broke new ground on this project with the tankless water heater installation. Noritz Builder Sales Manager Craig Burns worked together with Portrait Homes and Plumbing Concepts to select models that better met tough energy efficiency goals and solved aesthetic considerations that mattered to the apartment owners and future residents. 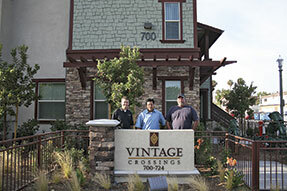 Putting together all the puzzle pieces at Vintage Crossing were (from left) Noritz Builder Sales Manager Craig Burns, Plumbing Concepts Engineering Department Manager Greg Paulino and Portrait Homes Project Superintendent Bob Pitsenberger. Putting together all the puzzle pieces at Vintage Crossing were (from right) Noritz Builder Sales Manager Craig Burns, Portrait Homes Project Superintendent Bob Pitsenberger and Plumbing Concepts Engineering Department Manager Greg Paulino. 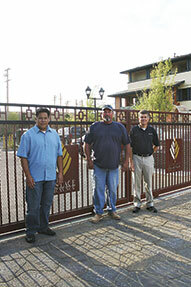 Plumbing Concepts Engineering Department Manager Greg Paulino (right) reviews the Vintage Crossings project details with Noritz Builder Sales Manager Craig Burns (center) and Portrait Homes Project Superintendent Bob Pitsenberger. 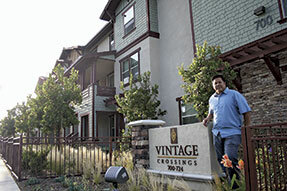 The construction team at Vintage Crossing – a 92-unit affordable apartment community in Anaheim, Calif. – puzzled together countless details to plumb each home with individually-metered tankless hot water heaters. 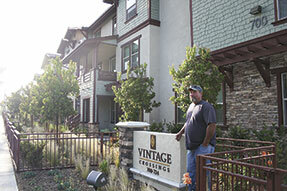 At Vintage Crossing, Plan C is actually a two-story unit, but its first level is on the second floor. 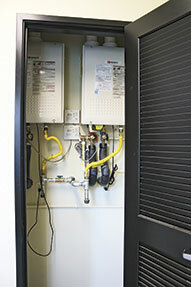 In a hallway closet on the second level of this unit, a NR83DVC is housed and vented vertically through the roof. 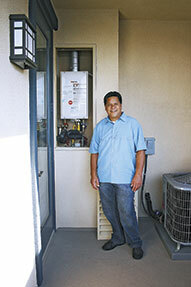 Plumbing Concepts Engineering Department Manager Greg Paulino devoted countless hours to engineer an installation plan the solved Portrait Homes’ aesthetic concerns that also provided for venting the tankless heaters in an efficient and code-compliant way.